One of the most courageous journalists of our time, Kemal Kurspahic tells a riveting tale of how media malfeasance stirred up the ethnic hatreds that led to the bloody Balkan wars of the 1990s. Drawing on extensive interviews with journalists in the region, the author recounts how—after serving Yugoslavia's communist party for decades—key Balkan media readily shifted loyalties to nationalist ideologues, doing their warmongering for them. 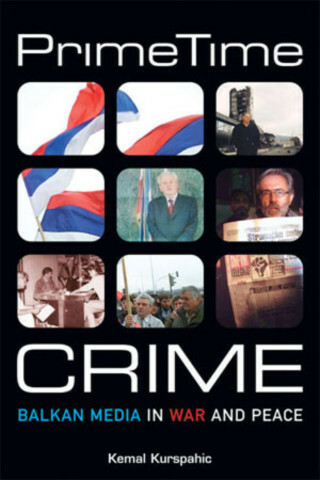 But Prime Time Crime is also the story of independent journalists who risked their livelihoods and their lives in an effort to tell a more balanced story. And it is a disquieting account of how the international community, post-Dayton, undermined the goal of creating a civil society in Bosnia by leaving the nationalists in control of the media. In a final section, the author offers recommendations for the international community in the Balkans and comprehensive lessons for media intervention in other countries undergoing transitions to democracy. Anyone who thinks Slobodan Milosevic left no paper trail is looking in the wrong place. Kemal Kurspahic's fascinating book documents how Milosevic seized control of the media, directed it, and organized the mechanism for propagating the Big Lie—turning truth on its head. As nationalism took over, a lot of journalists sold out their principles. But there are heroes in the story, the courageous few who never yielded to the demagogues. This is a rich, absorbing, and cautionary tale. Among newspaper editors in the former Yugoslavia, Kemal Kurspahic showed how to challenge communism, nationalism, and the politics of hate. With Prime Time Crime, he leads the way again, with a penetrating account of how many media outlets in his old homeland worked to turn communities against each other. He writes with a pain and passion informed by his own experience, but with the insight he gained by stepping back for a wider view. Kemal Kurspahic was editor-in-chief of the Sarajevo daily Oslobodjenje in 1988–94. He was named the World Press Review's International Editor of the Year in 1993 and the International Press Institute's World Press Freedom Hero in 2000. Author of three previous books, he is currently a spokesman for the UN Office on Drugs and Crime in Vienna.